Born Mary Leta Dorothy Slaton in New Orleans, Louisiana; daughter of Carmen Louise and John Watson Slaton. Carmen and John's marriage did not last long, Carmen later married Clarence Lambour; Mary Leta Dorothy took her step-fathers last name, Lambour. Dorothy, as she was known, dropped out of school at the age of 15, she attended a secretarial school and became an excellent typist. When she became wealthy, she typed her own letters. She won the Miss New Orleans beauty contest in 1931, after the contest Dorothy and her mom moved to Chicago. With no singing lessons, she tried out and got the vocalist spot with the group "The Yeast Foamers" which was sponsored by Fleischmann's Yeast. She later left "The Yeast Foamers" and moved to New York; in 1935 she got a contract with Paramount; she had her own musical program on NBC Radio. 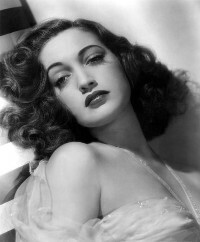 She also sang on the Rudy Valee radio show, it was during this time her name was changed from Lambour to Lamour. In 1936 she moved to Hollywood, at this time she began appearing in movies: Jungle Princess, Road to Morocco, Road to Bali, The Hurricane and Greatest Show on Earth; she was also seen in musicals: I Remember You, It Could Happen to You, and Personality. Some of the television shows she appeared on: Hart to Hart and Murder She Wrote. In 1980 she published her autobiography "My Side of the Road". http://www.viximus.com/_Viximus/Photos/Raw/4B44939C-F091-44FA-A072-3C22F606E242.jpg Lamour was the heroine of a novel, Dorothy Lamour and the Haunted Lighthouse (1947, by Matilda Bailey), where "the heroine has the same name and appearance as the famous actress but has no connection ... it is as though the famous actress has stepped into an alternate reality in which she is an ordinary person."